Thinking what to do with leftover naan? Make Naan Pizza. You will surely thank me for this easy naan pizza recipe. Last week, we had a dinner party and guess what, due to some last minute cancellations we were left with extra butter chicken and naan bread. 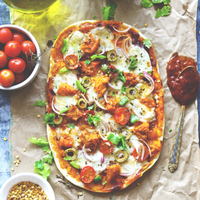 And the next day, butter chicken naan pizza was our quick dinner. First prepare the Naan. ( See naan recipe here ). You can use readymade naan as well to make the pizza. Next we need shredded or chopped butter chicken pieces or any other roasted Indian flavored chicken pieces. We prefer butter chicken as it has subtle flavor and mild spices, perfect to blend with cheese. Preheat oven at 200 degree C. Line baking sheet with parchment paper. Arrange the naans on the baking sheet with the charred side facing upwards. Spread pizza sauce equally over the naans. Make sure each naan is covered nicely with the sauce. Sprinkle each naan with cheese, capsicum, onion, olives, tomato, and chicken. Transfer baking sheets to the oven, middle rack. Bake for 15 minutes or until the cheese is nicely melted and the crust is bit crisp. Once the Naan Pizza is out of the oven, drizzle extra virgin olive oil, season with pizza seasoning of your choice (chili flakes, oregano) and sprinkle chopped coriander.